A former quarterback, running back and cornerback, Vance Joseph has garnered praise, criticism, honors, and controversy, enough to fill up his portfolio as a former professional player and now as a coach. As at 2018, the African American is currently the head coach of the NFL’s Denver Broncos. This responsibility has seen him write himself into the franchise’s history books as the first permanent head coach of black heritage. Joseph was a star back in the 90s with teams like the Indianapolis Colts and the New York Jets. His coaching career has also taken in stints with the San Francisco 49ers, the Miami Dolphins, and a few other NFL heavyweights. Born on September 20, 1972, the Marrero, Louisiana native became active in football when he enrolled at the Archbishop Shaw High School. Here, he played football and basketball. While Vance thrived in both sports, he decided to stick with football. Moving on to the University of Colorado in 1990, Vance Joseph finally focused solely on football. He played for Colorado’s Buffaloes team until he left in 1994. In his freshman year at the University, Joseph Vance played his part on the team’s route to clinching the National Championship title in 1990. He played as a running back and quarterback in his 30 games at the school. By the time he was graduating in 1994, he had posted a 55.7 percent passing accuracy, and 4 touchdowns. Joseph wasn’t drafted in the 1995 NFL Draft but joined the New York Jets shortly after as a defensive back. He subsequently played at Indianapolis Colts before the end of his playing days. For both teams he played a total of two seasons, turning out for six games and recording two interceptions. Focusing on his coaching career starting in 1999, Vance Joseph became part of the coaching staff of the Colorado Buffaloes. He would briefly move over to the Wyoming Cowboys in 2002 as secondary coach before returning to Colorado, this time as the defensive backs coach until 2003. He then fulfilled the same role at the Bowling Green Falcons for the 2004 campaign. Vance Joseph joined the San Francisco 49ers early the following year as part of the secondary coaching staff. He left the 49ers in 2011 and joined the Houston Texans as the defensive backs coach. His work saw the team’s defense setup make the top seven in the NFL’s rankings for three straight years. In those three years, the team also managed to clinch two division titles, which marked their first league victories in the team’s history. Armed with his success from his time at the Texans, he was signed on by the Cincinnati Bengals who needed his expertise and experience. He joined the team in January 2014 and his insertion into the coaching staff yielded almost immediate results. The defense recorded a league-best 41 interceptions. The Miami Dolphins came calling and snapped him up from the Bengals ahead of the 2016 campaign. He recorded similar success with the team’s defense which included helping the team finish high enough for the first time in eight years to be eligible for the playoffs. And then came his first opportunity as head honcho of an NFL team. He was signed to the Denver Broncos as head coach on January 11, 2017. This made him only the second African American to hold that position for the team – after Eric Studesville’s 4-game tenure seven years prior– and the first to hold it on a permanent basis. He ended his first campaign with the Broncos with a 5–11 record. Joseph has had his own share of controversy. Since 2004, the NFL coach has had sexual assault accusations hanging over him like a cloud. The first accusation came in 2004 in his time with Colorado. Two female trainers laid allegations against him claiming that Vance had sexually assaulted them. However, the case was closed after both women in question refused to move forward with any kind of trial or investigation. It reared up again in 2017 during his interview for the position of the Denver Broncos head coach. He was again investigated and asked about the assaults point blank during the interview. Joseph denied all the allegations. Vance was born to his parents Linda and Robert Joseph. Through them, he has an older brother named Mickey Joseph. Mickey was a much more popular player than Vance in his time and since 2017, has been on the Louisiana State University coaching staff as a wide receivers coach. 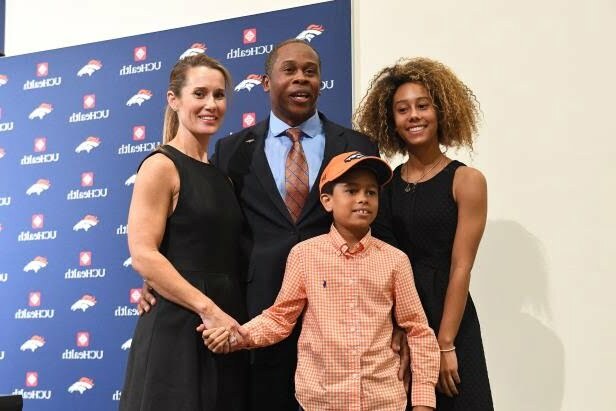 Vance Joseph is married to his wife Holly Joseph (formerly Pittman). Together, the couple has two lovely children, a daughter they named Nataly, and a son named Stone. It is natural to expect that as a head coach of one of the top teams in the National Football League, one should be earning some big bucks. This may be true in Vance Joseph’s case, however, his take-home salary and overall net worth remain uncertain.